As of October 4th 2016, we’ve updated our policy to allow Performing Rights Organization (P.R.O.) registered music to be sold on AudioJungle. To help ensure a consistent experience and music offering for customers, as part of this new policy there are some additional settings & requirements for all AudioJungle authors, and obligations for authors who wish to sell P.R.O. music. The P.R.O. setting & attribute information we collect will be used to provide additional clarity and transparency to AudioJungle customers during their search, browsing, and purchase experience. Please note that while we allow P.R.O. music to be sold on AudioJungle, authors must not submit audio or music that is registered with any other rights management organization or publishing platform that may restrict or conflict with the rights provided by the Envato Market licenses. Please be very careful about with whom and where you register your music and always check the small print. Failure to do so could potentially breach your membership agreement with Envato. 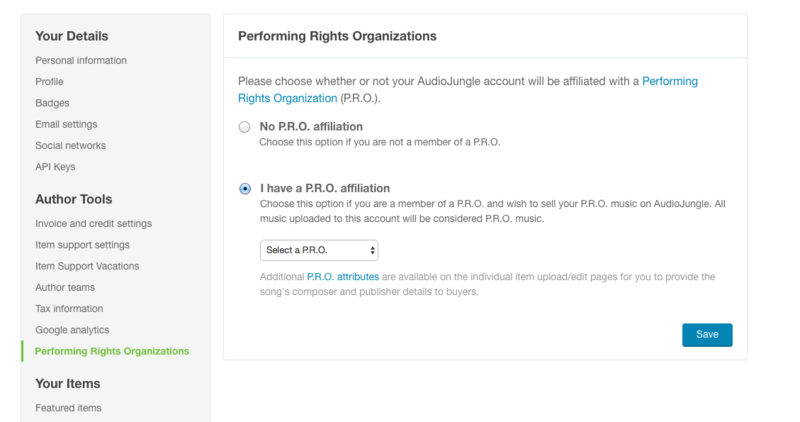 For example, if you register your music via an all-in-one music distribution service, make sure that it doesn’t include licensing/sync/publishing rights if you’re an exclusive AudioJungle author. If you do register with a P.R.O., it may be best to do so directly. 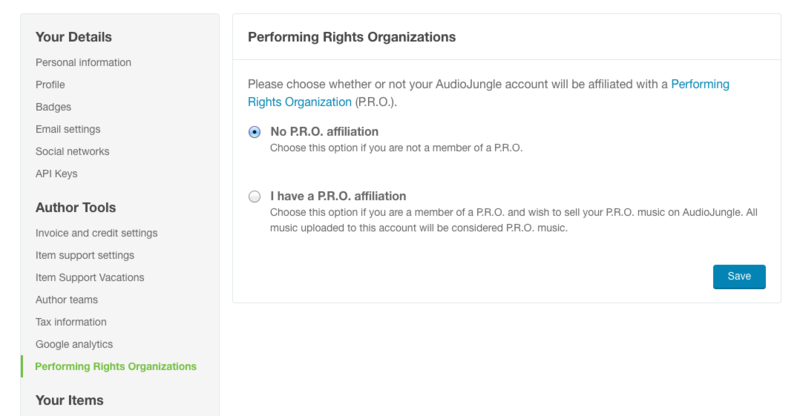 With the change to this policy, we’ve introduced a new author setting for you to select whether or not your AudioJungle account will be affiliated with a P.R.O. As this is very important information for customers to have, this setting must be filled out by all AudioJungle authors in order to sell & submit music on AudioJungle. If you do not have this set, you will not be able to upload items to AudioJungle. If you don’t belong to a P.R.O., or don’t even know what a P.R.O. is, simply choose “No P.R.O. Affiliation” and save your changes. It’s as simple as that! Alternatively if you are a member of a P.R.O. and wish to sell P.R.O. music on AudioJungle, choose “I have a P.R.O. Affiliation” and select the specific P.R.O. you are registered with from the provided dropdown list. Please be aware that due to differing local laws around the world, and to make things clear for buyers globally, this P.R.O. setting will apply to your entire account. By selecting a P.R.O. affiliation, it means that all of the music in your AudioJungle portfolio will be considered P.R.O. music. Additionally, to ensure consistency and prevent abuse, once your account is set as P.R.O. affiliated you will not be able to change this setting yourself. If for some reason your P.R.O. affiliation changes, you will need to contact our Help Team and provide additional details to support your request. Please note that this setting is simply intended to provide AudioJungle customers with information about your P.R.O. affiliation. 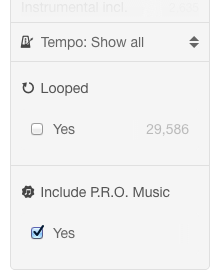 Filling out this information on your AudioJungle account does not actually register your music with a P.R.O. in any way, nor is Envato party to any relationship you may have with your P.R.O. If you have set your account to be P.R.O. 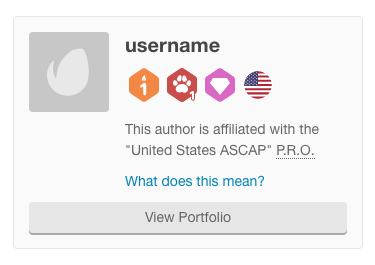 affiliated, you will find two additional attributes on the item upload/edit pages for you to provide the song’s composer and publisher details to customers (including name and IPI number), e.g. for use on cue sheets. This information will be made available to customers in the attribute area on the item page sidebar. You may additionally provide this information in your item download/documentation, author profile page, or wherever else you feel is beneficial. If you have set your account to be P.R.O. affiliated, this information will be displayed on your user info panel on AudioJungle, along with a link to the customer oriented Help Center article. While it’s okay to submit and sell P.R.O. music on AudioJungle, please be aware that we neither recommend it nor advocate against it. And while we may be able to provide general trends and information from time to time, we are unable to guarantee whether registering your music with a P.R.O. will or will not have an impact on your AudioJungle sales. Choosing to join and register your music with a P.R.O. is entirely up to each individual author and what they believe is best for their music and personal success. Whichever you may choose, we do always recommend that authors take the time to independently educate themselves about what a P.R.O. is and how they work, which P.R.O. may or may not meet their needs, and to make any decisions to join and register their music from an informed perspective. Keep in mind that P.R.O.s in different countries operate under different rules and laws, so it is important to understand the details of your specific local P.R.O as well. Before choosing to join a P.R.O., you may wish to speak with a music rights lawyer or specialist in your country. It is very important for customers to have clear and accurate information about their rights to the music they have licensed. While we provide a way to display standard P.R.O. details to customers on the item page, it is ultimately your responsibility to ensure that the P.R.O. information on your account is accurate and up to date. Should a customer contact you for help in obtaining or confirming any P.R.O. related information regarding your music, we expect you to assist them in a professional manner and to the best of your ability. For more information on customer related considerations around this topic see Buyer’s Guide to Performing Rights Organizations and P.R.O. Music. We also recommend you link to this customer-oriented help article in any documentation or readme files you may provide along with your P.R.O. music. We expect members of our community to be honest, straightforward and accurate in what you present to others about your items, including whether or not you are a P.R.O. member and your music is registered with a P.R.O. If you are currently not affiliated but choose to join a P.R.O. in the future, be sure to update your P.R.O. setting on AudioJungle immediately.